" Kiss goodbye to cracked lips! Savor the delicious juicy taste of water melon on your lips. 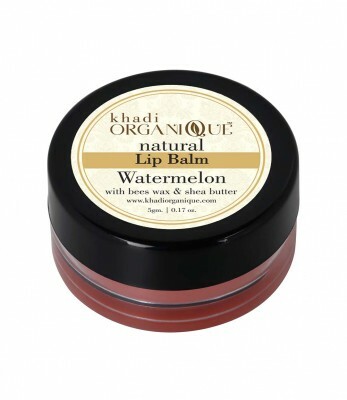 Packaged with essential oils, natural butters and honey, this nourishing lip balm hydrates your lips with lasting effect. Shielding your lips from the harsh weather, it moisturizes and fills the cracks. A unique formulation by Khadi Organique, it gives your lips a smooth supple feel. Invigorating and energizing, it gives your lips the pampering care they deserve. The emollient properties make your lips soft healthy giving you a pout that everyone envies! " " Watermelon Extract, Apricot Oil, Avocado Oil, Vegetable Oil, Jojoba Oil, Almond Oil, Carrot Seed Oil, Vitamin E, Wheat germ Oil, Bees Wax, Cocoa Butter, Kokum Butter, Shea Butter, Honey, Glycerin, Fragrance, Color "